As deliveries arrive on campus, packages addressed to residential students are placed in individual lockers by the Document and Mail Center team throughout the day. Residential students are sent an email with a unique code they can use to access the Package Locker Station at their convenience. The Package Locker Station is located on the east side of the Donius University Center near LJ’s. The station is custom wrapped and features Louie, with a large “Go Saints!” across the front. The station can be accessed from an exterior entrance as well as through the Donius University Center atrium. “Maryville is the first university in St. Louis to install this type of station, and we are very excited for our residential students to experience this innovative technology,” said Laura Stevens, Director of Auxiliary Operations. 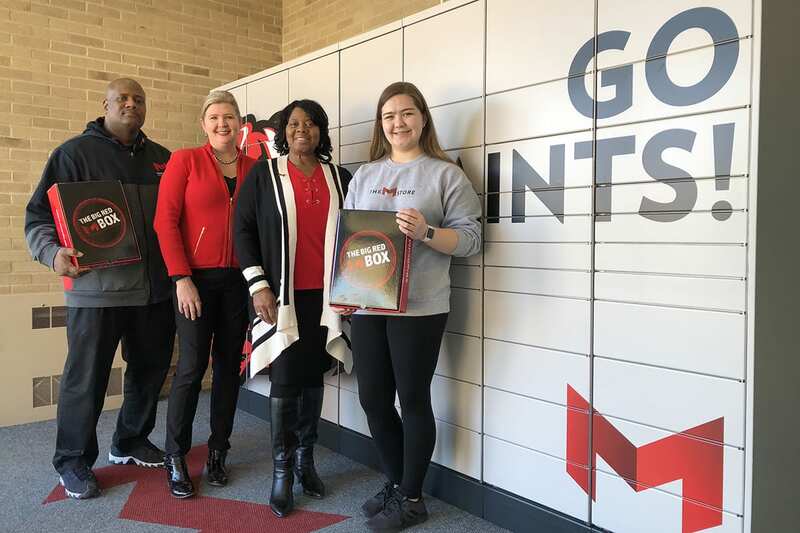 “We’re especially thrilled to be able to provide this student-centered service after hours when The M Store is closed, giving our residential students greater flexibility to access their packages whenever they want,” she said. To learn more about the Package Locker Station, please watch our Facebook Live interview with Stevens.